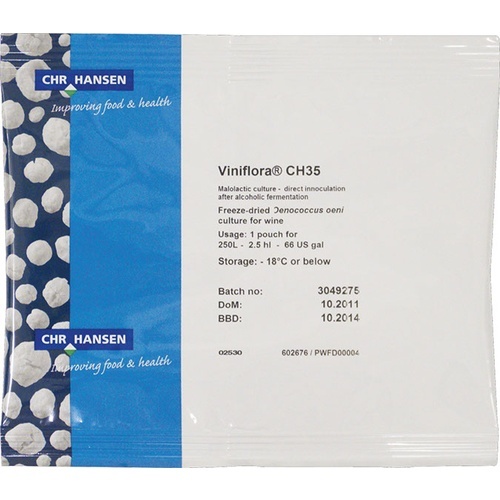 Viniflora CH35 is a freeze-dried culture of Oenococcus oeni. This malolactic bacteria has been selected and adapted especially for direct inoculation of rose and white wines. Viniflora CH35 has been selected for its outstanding performance in malolactic fermentation of difficult white wines. This strain is the perfect match for rose and white wines but can also be used with success in red wines. Viniflora CH35 should be added to dry wine, right after the alcoholic fermentation. No rehydration or reactivation is required. I know it works in my royal cider. I plan to experiment with other strains next year, but for now I go with what I know works well with my blend. Working with high acid white and rose' want to keep as much fruit as possible as your commentary of the product suggests. It lends a buttery character to white wines and I'm making a white wine right now. I just used Viniflora CH35 for the first time. It does not seem to be doing much. Maybe it is a slow starter. Anyway, my Enoferm Beta is working side by side on another batch and it is working great. Excellent hassle free MLB strain. Easy to use and great results using co-inoculation in Chardonnay juice. No trace of diacetyl flavors. Highly recommend this strain.